Long before there were helpful travel blogs, I used guide books to plan upcoming trips. Even today, they're still useful. 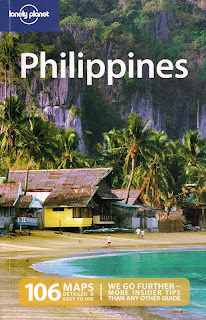 From my local library, I borrowed the Lonely Planet Philippines - the 10th reincarnation of this popular backpacker's bible published in May 2009. I brought this to work and read during lunch breaks at the staff lounge where those reading fiction paperbacks stared at me and say: "you're travelling again?!" Nothing can certainly illicit envy in the cramped, cubicle world of workaholic America than reading a travel book. While working in Saudi Arabia years ago, I bought the 6th Edition of the Lonely Planet Philippines written by Jens Peters. I was getting ready for my annual sabbatical at the time. A British colleague had this surprised look as she eyed my book: "You're a Filipino and you're reading this?" Why not? There are so many islands out there that I know nothing about. Ironically, it took a German wanderer to write an extensive guide book about the country. Jens Peters liked the Philippines so much it's his favorite in Southeast Asia. He wandered up and down the many islands, visiting more than 50 times, spending more than eight years and later wrote: "Although travelling in the Philippine archipelago can tax your flexibility at times, you would have to go a long way to find people as friendly and helpful as the Filipinos. This place, as the locals like to remind you, is 'where Asia wears a smile'." His book travelled with me in 1998 on a bus to Sagada where his map helped me find my way around the hanging coffins. It also went with me on a trip to Caramoan even if there was no mention yet of that idyllic hideaway. In Cebu, I found the right bus that led me to Maya where bancas for Malapascua island awaited. At a time when the Internet wasn't much of a help yet, Jens Peters' work on the Lonely Planet Philippines pointed me in the right direction. 12 years later, with plenty of travel websites about the Philippines and hundreds of blogs already out there, I find reading the current edition actually supplements what is available online. Reading the book also puts me at the viewpoint of a foreign adventurer - I like to know what they see and think about the country. A collaborative work of four foreign authors: Greg Bloom, Virginia Jealous, Piers Kelly and Michael Grosberg, this 484-page book may look like a skinny sister of the 820-page edition on Thailand but it does give the most current updates on many of the local adventure destinations. As the authors point out: "There's no question that the Philippines is a little more challenging to visit than some other Southeast Asian countries. . . It's separated from the Southeast Asian mainland by several hundred kilometers of ocean. . . There's the relative lack of tourist infrastructure compared to its neighbours. The so-called 'backpacker trail' has yet to find its way to the Philippines. But that's all part of the appeal for many travellers, and those who make the effort to get to the Philippines tend to be pleasantly surprised." And just like Jens Peters, the authors unanimously highlight the "ever-relaxed, happy-go-lucky people" who make the visit for a foreigner more surprising and memorable. "Many arrive expecting the country to be 'dangerous', to discover instead a land of shiny happy people. When everybody's smiling like it's going out of style, how can you not enjoy the place?" Indeed, despite all the trials and tribulations, calamities and catastrophes, it's really amazing the Filipino can still smile for all the world to see. Bahala na. One would think living in "a land where Asia wears a smile" is much better than being stuck in a land where Prozac is the one smiling. But knowing there are more Pinoys turning global in their pursuits, that smile is certainly going more places. Your gorgeous capture of different places in the Philippines really make me wanna go home. Wonderful! Wow, that's a great book. Honestly, I haven't seen any of their books but I would love to have one! There are many beautiful places in our country and yet we lag behind Thailand and other Asian neighbors in terms of tourist arrivals. I hope our tourism will improve soon. I'm still using the 2003 edition with lots of outdated info...time to get this new ed. Thanks for the heads up. ahhh traveling!!! it's my passion other than dining, lol, if only i have extra budget for trips & journeys, here and abroad; i'll be more thant content. tama ka, sobrang daming gandang puntahan dito sa pinas na dapat ipagmalaki at dapat marating. i've been to few countries abroad and enjoyed short trips and vacations to local provinces here, but life is damn short to experience all the seven thousand and more islands of our country. when I decide to use "Lonely Planet" as URL for my blog, I wasnt aware the famous travel' guide book is existing. i gave a diff meaning to it though, personal loneliness and greatness out of my happiness and weakness..
when I chanced on finding ur blog, I thought Im reading a nonPinoy blog as u've been into far places and document it in an extra-ordinary way. I understand now how L.P. did inspire you and make you one well-respected blogger, and a filipino blogger at that - I've been a fan of yours that day and onwards. you are privileged to see many places in and out of the country. and txs for sharing what u got in return. and for sharing it with a smile. I knew you made the foreigner smiling too. i have the 2006 edition of LP and i agree with you that most travel blogs now can supplement the information about where we want to go. and there are really great blogs out here that i follow and use them as guides in my travel. by the way, i notice that you seem inspired by this post and would probably say that this is one of your best. great job. alam mo bang noong bata pa ako sa probinsiya namin sa zambales, may tinulungan akong dalawang israeli na backpacker na hindi alam kung saan pupunta? ang tanong nila ay kung saang hotel sila puwedeng matulog. sabi ko walang hotel sa amin. pero itinuro ko sa kanila na magpunta sila kay mayor. doon maraming kuwarto. two nights later, may pasayaw sa plaza namin, at kasama sila ni mayor. hahaha. mula noon, alam ko na na if you ask questions, people will help. which helped a lot when i go backpacking alone in various countries. Thanks! I'm going there this weekend. 'Ika nga, nakakataba ng puso, di ba? Oo naman, that's what travel blogs are for. Salamat. I do hope as well. Ace Durano is doing a great job promoting the Philippines. Traveling need not be expensive - sa Davao & nearby provinces na lang ang dami mo ng pwedeng puntahan. You do need an updated edition. Just not sure when the latest LP Philippines will be available there. Oh yes, travel guide books are still indispensable. Sabi nga sa LP, kahit nga isang araw ka lang for each of the 7,100 islands, you need 20 years to do it! That's one thing I noticed with your URL initially - I thought yours was exclusively a travel blog - but it's great! Di naman mawawala ang pagmamahal natin sa Pilipinas. Thanks for noticing that I was inspired - I'm going to the Philippines this weekend kasi. Yes, I've read Jens Peter's own book after his LP edition. I agree it's more detailed and has more pages. I do keep my 1997 edition though. Salamat! Kaya marami sa mga dayuhang bisita sa Pilipinas ang naso-sorpresa sa pagkamatulungin ng Pinoy. Salamat naman at sa mura mong edad noon, pinakita mo na yan. Hello sir, would like to know if that book is available online? Philippines has so many beautiful destinations to choose from. Personally, I don't see the reason to go anywhere else besides the Philippines. i just had a discussion with friends on egroup about being "well-traveled." my friend said she's only seen 3 percent of the world. i said that i probably have seen 3% of my own country. a friend of mine travelled to pinas on a whim. he was in china and suddenly made a spur of the moment decision to visit pinas. he went to cebu and enjoyed himself. upon return he showed me all the photos and related to me how wonderful the people were to him, how cheap a haircut is, etc. my husband looked at me with every story and asked, if that were true. i haven't been home since 1999 and i too would like to see the pinas in the eyes of a tourist. I agree there's plenty to see and experience in the Philippines but traveling beyond is really a matter of personal choice. A whole lifetime indeed if you really want to know each province intimately. Wow, after a decade, it's about time you visit the Philippines. And bring your husband as well so he knows how friendly Pinoys can be. oh you're coming home? you MUST try the celdran walking tours! it will give you a very fresh perspective of the country. "I believe that Manila can be a reflection of your state of mind. Being a city of extreme contrasts it’s easy to see how it can become an intense personal experience. Manila can be chaotic and spiritual, dirty and divine, gritty and gorgeous all at once. If you don’t find beauty and poetry here, you will never find it anywhere." Indeed, Asia wears a smile in the Philippines. Thanks for visiting my site. I'd like to add your site in my blogroll. God bless! well-said, Nomadic Pinoy. Actually, I get offended hearing some people say that the Philippines is very dangerous place to visit because danger can always be there whether you are just riding the bus/train or just eating out. I also feel flattered and proud that foreigners find our country beautiful. It's just sad that some of our countrymen prefers to know other countries first before knowing their own, the Philippines. Happy travelling! Btw, we have the same prayer as to Caramoan, I really hope and pray it won't go the way where Boracay is now. Now I'm itching to get a copy of the latest LP! Have loads of fun on your upcoming trips...and btw re: tokina 10-17mm, it's light and great for travels! Hi there, thanks for visiting back, hope we can xlink so we can visit each other's sites often..
About my kids, yep, I make sure that I teach them Filipino values which my husband is really appreciates. My son call my daughter ate and they uses po and opo.. I thought about that but I haven't got enough time in Manila. He's actually recommended in the LP. Many times, we only discover how beautiful the Philippines is after traveling/living elsewhere. Thanks too for visiting. I'll be checking your site again. It is really flattering that we hear positive views after all that bad news. May karapatan naman talaga ang Pinas na makipagsabayan kahit sa Thailand. Thanks a lot for that info. I've been researching on 3rd party lens. Wow, I'm impressed there just as your husband is. For them to say po and opo is quite rare for Fil-Am kids! I'll check you site again. You write well, I admire your prose and style of writing--easy to read and mellow. I have also read Jens Peter's book and I agree it's one of those Philippine travel books written with a personal experience in the background. madami talagang magagandang lugar d2 sa pinas, di lang natin naBi2gyan ng pansin. Madami ding travelling blog.. Pero paminsan magastos kc, i mean magastos talaga. Kung wala ka naman budget.